Colleagues at GNIP and MapBox recently published this high-resolution map of iPhone, Android and Blackberry users in the US (click to enlarge). “More than 280 million Tweets posted from mobile phones reveal geographic usage patterns in unprecedented detail.” These patterns are often insightful. Some argue that “cell phone brands say something about socio-economics – it takes a lot of money to buy a new iPhone 5,” for example (1). 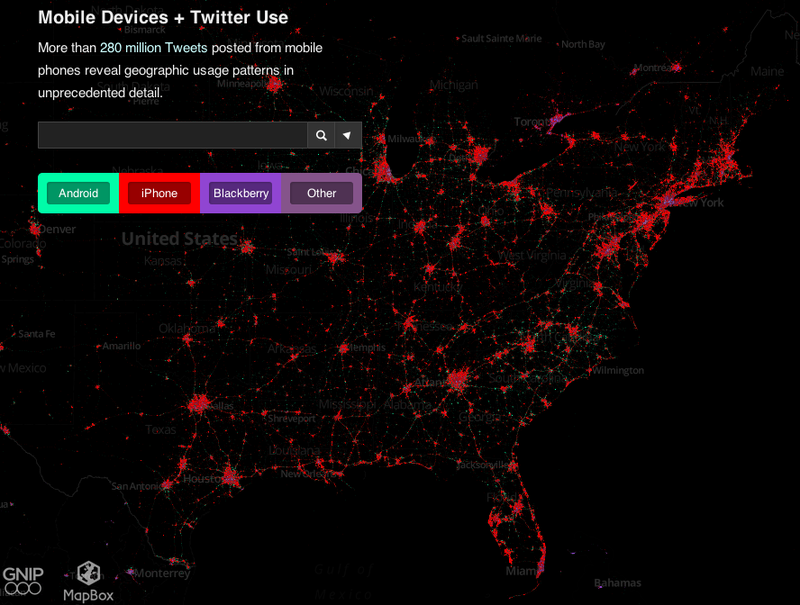 So a map of iPhone users based on where these users tweet reveals where relatively wealthy people live. 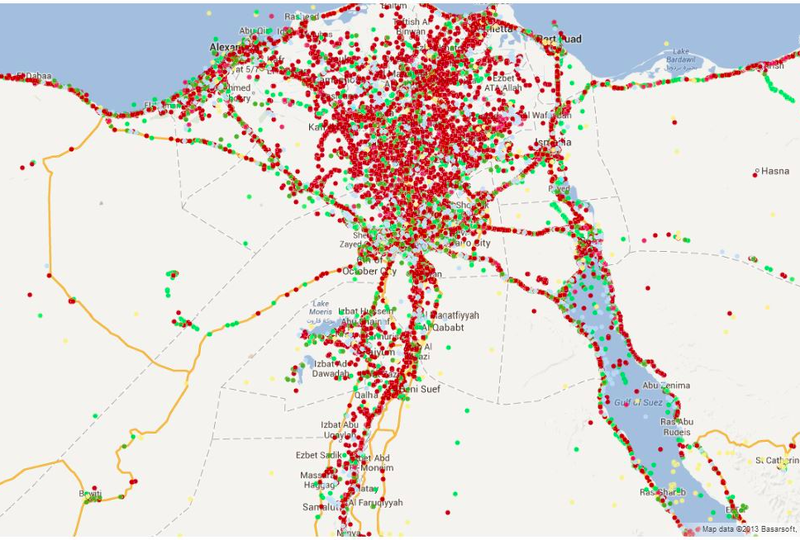 As announced in this blog post, colleagues and I at QCRI, Harvard, MIT and UNDP are working on an experimental R&D project to determine whether Big Data can inform poverty reduction strategies in Egypt. More specifically, we are looking to test whether tweets provide a “good enough” signal of changes in unemployment and poverty levels. To do this, we need ground truth data. 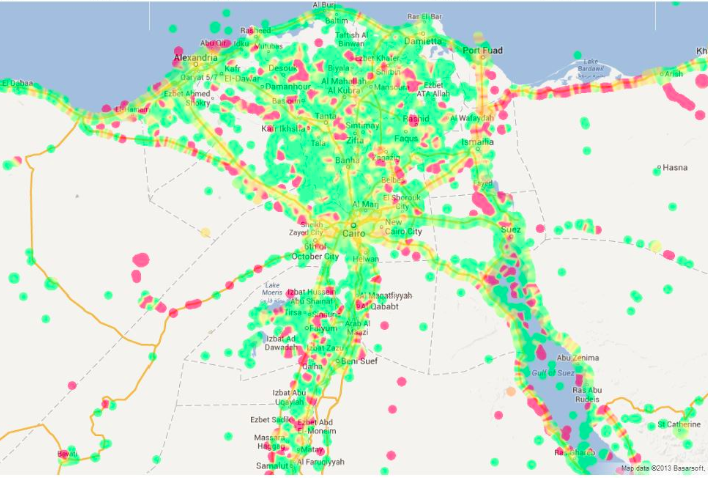 So my MIT colleague Todd Mostak put together the following maps of cell phone brand ownerships in Egypt using ~3.5 million geolocated tweets from October 2012 to June 2013. 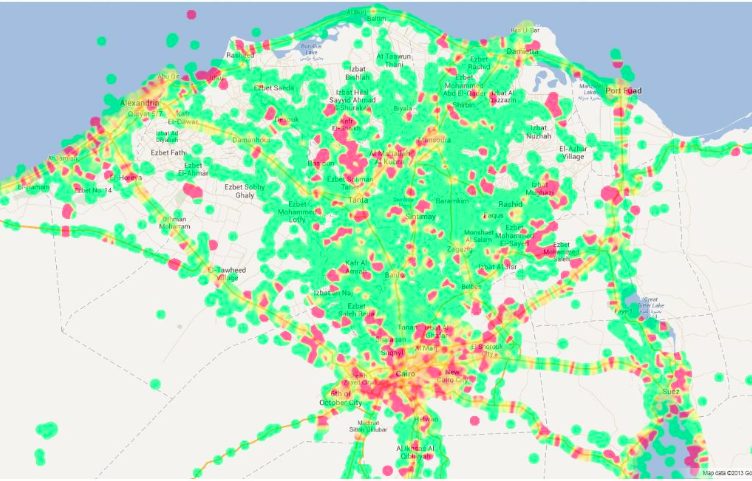 Red dots represent the location of tweets posted by Android users; Green dots – iPhone; Purple – Blackberry. Click figures below to enlarge. Lastly, the heatmap below depicts geo-tagged tweets posted by Blackberry users. As Todd notes, “We can obviously break these down by shyiyakha and regress against census data to get a better idea of how usage of these different devices correlate with proxy for income, but at least from these maps it seems clear that iPhone and Blackberry are used more in urban, higher-income areas.” Since this data is time-stamped, we may be able to show whether/how these patterns changed during last week’s widespread protests and political upheaval. This entry was posted in Big Data, Social Computing, Social Media and tagged Android, Blackberry, Egypt, iPhone, Location, Map, Twitter. Bookmark the permalink.